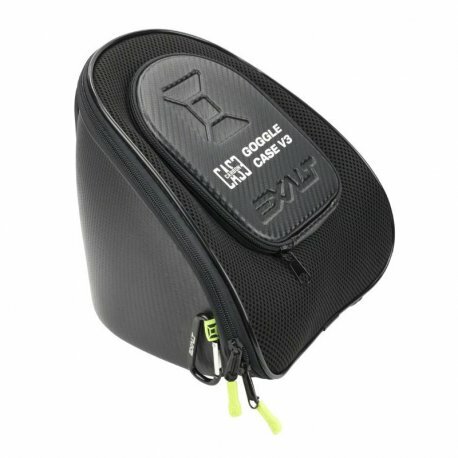 The latest iteration of the best goggle case in the game, the V3 Exalt Goggle Case is a lightweight, ultra-strong protective solution for nearly all goggles. NEW alloy STEEL internal FRAME design stops the case from being crushed or deformed, while the plush microfiber lining stops the lens from being damaged or scratched during transport. The exterior of the case is lined with water and stain resistant material, and is thermoformed to maintain its rigid, protective shape while inside your bag or car. The rear of the goggle case is lined with a mesh back retainer to keep the goggle in place, but also allows proper air circulation to dry your goggle foam and prevent moldbacteria from forming. The V3 Goggle Case also makes use of the void inside the goggle with a redesigned larger zippered, microfiber lined storage pocket that can accommodate a large cell phone, keys, and other valuables with ease.